Robert B. Payne, Inc. specializes in servicing and installing quality natural and propane gas fired warm air furnaces. If you already have a warm air furnace, we also offer professional maintenance in order to help you get as many years out of your furnace as possible. The AFUE (Annual Fuel Utilization Efficiency) is the measure of efficiency of a furnace or heating system. It is also a way to measure a gas furnace’s ability to change fuel into energy. The higher your unit’s AFUE, the more energy efficient it is. 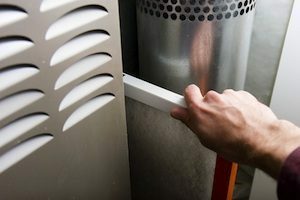 If you are not sure how efficient your furnace or heating system is, allow us to take a look at it. While having an entirely new furnace installed in your home or business will cost you money, it will undoubtedly also save you more money in the long run. If you would rather not have a brand new furnace installed, our knowledgeable technicians will be more than happy to make recommendations about what you can do to lower your energy bills and save money. If your current heating system is outdated or inefficient, we can make a recommendation based on your specific needs and budget. For more information about warm air furnaces, or if you would like to speak to one of our representatives about financing, contact Robert B. Payne, Inc online today or call at (540) 373-5876.